Yes, there are multiple solutions being used inside central government to support Digital Identity. But that doesn’t mean that’s necessarily a problem – as it turns out multiple levels and forms of ID may be what works best for citizens anyway. That would seem one way, at least, to interpret how major parts of Government see their task in terms of making Digital Identity work in the wake of the October decision to allow the private sector a bigger hand in shaping the destiny of the technology, with GOV.UK Verify to cease receiving taxpayer financial investment inside 18 months. How we know this: because we heard it from the proverbial horse’s mouth – or to be more precise, senior stakeholders who are thinking and wrestling with Digital ID issues on a daily basis in Westminster, and who told us of their on-going mutual dialogue together on-stage at last week’s highly successful Think Digital Identity For Government 2018. 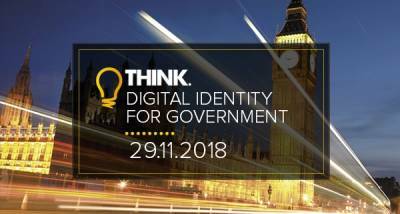 The context at the Westminster event was a special ‘Cross Government Identity’ panel that featured a conversation between Cheryl Stevens MBE, Director, Identity & Trust Services at DWP, Paul Heskins, Senior Operations Group Leader and I.D. Steering Group Chair at DVLA, and Alison Walsh, Business Readiness Lead for External Government Departments, Government Gateway Transformation Programme, HMRC. “In practice, we found that a single, ‘high hurdle’ ID just doesn’t work for DWP, and you need all sorts of levels to be there – including zero,” Stevens pointed out. “We’re doing the right thing in government now, which is sharing knowledge about ID and having conversations like this one,” added DVLA’s Heskins. So a post-Verify world – but that should be read as one that is about lots of pragmatic approaches to the ID problem, not as abandoning it, concluded the panel. “At DWP, when it comes to Digital ID we think ‘proportionate, secure and omni-channel’,” Stevens told delegates at the UK’s only conference in the sector that looks at the public sector perspective. “We’ve got to pull together to solve the Identity problem, as I can see real potential to help real people here – but we probably need a ‘pantry’ full of solutions to do that,” she added.